Pic and Draw is a fun and useful application that allows you to take pictures or use old ones from iPhone gallery ( Example: Your shopping lists, list of tasks , Photos of friends , Plans, etc ...) and you can edit them simply by drawing on your screen with your finger or stylus, add bubbles and discussions and leave you free to your imagination. 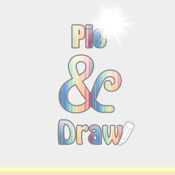 Once the choice of the captured image is done, it is loaded onto Pic & Draw in the application, you can give it a title and write comments if you wish. All you have to do is just save the photo. By accessing a photo in the edit list, you can block , draw, or scribble cheker or other directly on the picture you just saved . - The choice of color with a palette of colors with a full palette of 1024 colors and shades . - The line thickness from 1 to 99 . - The ability to erase with an eraser and choose its thickness. - The ability to erase everything and start over . - Add one or more bubbles of discussion among those proposed , enlarge or shrink using the zoom with two fingers. - Enter the text bubble . - The plus is that you can also enter notes with the keyboard on your iPhone to be able to add that you forgot to start. After editing you can save the images that you changed for later viewing or download on your iPhone and share otherwise. - Share them with your friends on Facebook . - The email to your friends.